Q4 2008 Vs Q1 2018... Apocalypse Then Versus Euphoria Now?!? I'd like to discuss the fourth quarter of 2008 vs. the first quarter of 2018. The two quarters in which the US undertook the greatest increases in federal debt but supposedly represent entirely different outcomes (I'm excluding and smoothing out the Q3 2015 debt deluge after the Q1-Q2 debt ceiling debate). 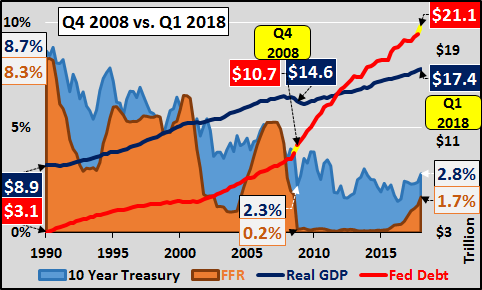 The chart below shows total federal debt (red line) in perspective against real inflation adjusted GDP (blue line), the federal funds rate (shaded brown), and the 10yr Treasury yield (light blue shading). It ain't a pretty picture. 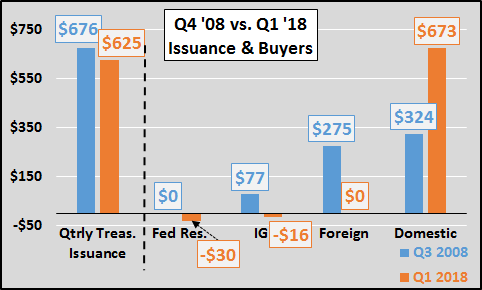 The chart below shows the quarterly net issuance on the left and the change in holdings by the four sources of buying on the right. 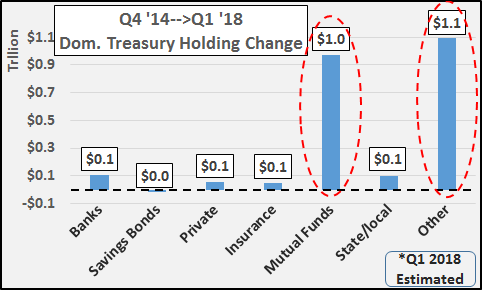 What you will notice is a seemingly unbelievable surge in US Treasury holdings by the "domestic public". 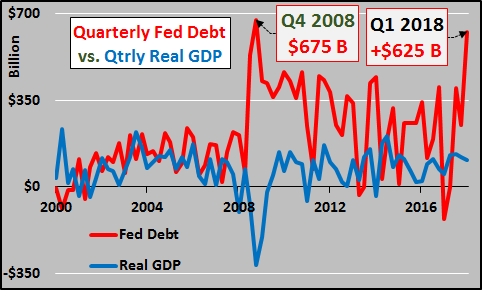 In Q4 '08, outstanding Treasury debt rose by $676 billion and although the Federal Reserve took none of that (QE didn't start until Q1 2009), the Intra-Governmental surplus (SS, etc.) ate up $77 billion (reducing marketable debt), foreigners (particularly China) scooped up $275 billion, and the domestic public (banks, insurers, pensions, etc.) was left to digest the remaining $324 billion. Compare Q4 '08 to Q1 2018; Federal Reserve holdings declined by $30 billion (and the Fed's balance sheet is set to shrink by hundreds of billions annually through 2020) , the Intra-Governmental holdings fell by $16 billion as benefits paid out outpaced surplus revenue (likewise, this selling is set to accelerate as surplus turns to outright deficit), foreigners likely continued selling (foreign holdings, led by Chinese/Japanese selling, have declined by $65 billion from October through January) but the final Treasury TIC data won't be available until this Summer...so I simply left foreign holdings unchanged. This meant about three quarters of a trillion in net new Treasury debt was swallowed up by "domestic sources" in the first three months of 2018. Further details on the situation are detailed here Who Will Buy Those Trillions of US Treasurys??? This amount of Treasury debt being ingested by "domestic" sources (particularly absent huge selloffs in other asset classes to raise the funds) is off the charts in its scale and simply very hard to believe. Seems a deeper dive into who exactly those "domestic" sources are is in order. Thanks to the Treasury Bulletin...we've got some idea. As the chart below highlights since 2007, there are two sources doing all the heavy lifting. 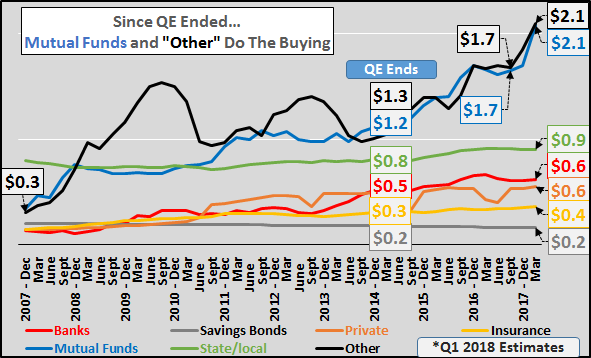 Since QE ended in Q4 of 2014, Treasury debt has ballooned by $3 trillion, of which mutual funds and a grouping titled "other" have added over $2 trillion (taking in 70% of the net increase in Treasury debt). For those wondering...according to the Treasury, "other" includes individuals, GSE's, brokers/dealers, bank personal trusts and estates, corporate and non-corporate business, and other investors. The holdings of this group of "others" and mutual funds have mushroomed in size compared to those of insurers, banks, pension funds, or "private" investors. It is hard to believe all of this adds up to anything more than state level fraud. That America's ability to fund it's massive deficits via the Treasury market and manage the interest paid on that rapidly growing pile of debt are no longer dependent on market participants...but likely being enforced by the very pointy end of American "diplomacy".